Imagine sleeping in a luxury king-size bed on a raised deck in the middle of a game reserve, surrounded by the calls of nocturnal animals, with nothing between you and the brilliant stars of the Kalahari night sky. 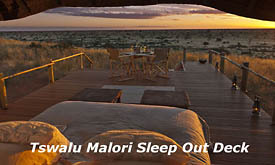 Tswalu Kalahari's newly launched sleepout deck, The Malori (meaning 'dreamer' in Tswana), offers guests the unique experience of a safari sleepout on a magnificent 100,000ha five star private game reserve. 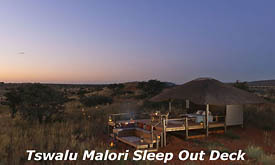 The Malori deck boasts a raised platform with a thatched overhang for protection should it rain. 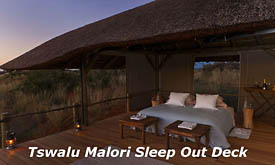 Guests can choose to sleep under the thatch or further along the deck where it is completely open. The quaint bush suite also has weather-proof blinds which can be rolled up or down according to preference. There is no compromise on luxury. The king-size bed is dressed with exquisite Aldona linen. Luxury towelling robes and slippers are provided and an adjacent outdoor toilet, basin and shower are just a short distance away along a lighted walkway. A simple fold-up table and camping chairs and a cushioned couch complete the barefoot luxury. The Malori deck is built to maximise the exquisite surroundings and has panoramic views of the vast plains of the Green Kalahari. 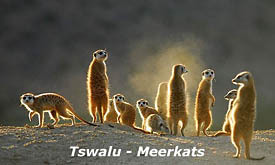 It is orientated to showcase the incomparable Kalahari sunsets. 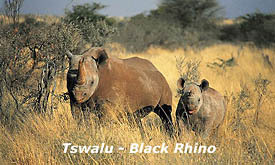 Guests are escorted to the sleepout by a guide on a game vehicle from either The Motse or Tarkuni Private Villa . On arrival, the guide sets up drinks and snacks and while the guests are enjoying the spectacular views over their sundowners, the chef prepares dinner. Dinner is a relaxed meal prepared in front of the guests, followed by dessert. Guests are then left to enjoy a cheese and biscuit platter and a night cap, before retiring in privacy to enjoy their own Kalahari sleepout experience! 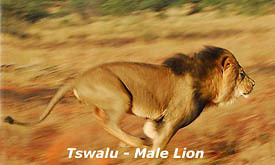 Wake at sunrise to birdsong and the sounds of the early morning in the Kalahari. Your guide will bring your tea and coffee tray and set up a delicious continental breakfast on the deck. Or you can choose to take a horse ride, walking trail or game drive back to the main camp, stopping for a picnic breakfast along the way. 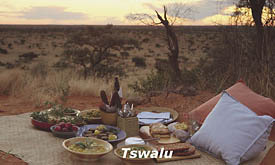 Tswalu also provide children's camping beds, so the whole family can enjoy an exhilarating Kalahari sleepout under the stars.